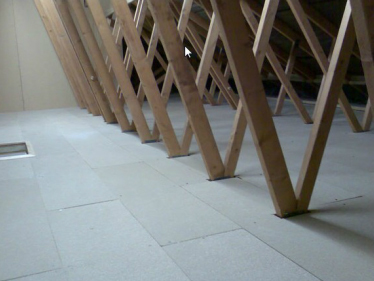 Find your perfect loft flooring with Surrey Loft Installations. Your loft may not be one of the main rooms of your house, or commercial premises. However, this doesn’t mean that it shouldn’t be fully utilised for storage, as a hobby room, or even converted to another bedroom! With this in mind, it’s vital to fit your loft with a floor that not only assists in the insulation of the room, but also looks good and lasts! Here at Surrey Loft Installations, we have the perfect range of flooring services. What flooring services does Surrey Loft Installations offer? High quality chipboard flooring, which measures at 18mm and is totally water resistant. Options can include joist rising and insulation solutions �?important elements to consider for required building regulations. We will only screw the chipboard flooring onto the existing joists of your loft, meaning you can easily access what’s below it without damaging the flooring structure. We ensure that any under-floor cables are neatly notched to the existing joists, with markings on the loft floor to make them easy to locate. The chipboard flooring we use is created with a tongue and groove design �?this is great for adding extra strength and stability to your loft floor. We keep mess to an absolute minimum! All of the resizing and cutting of the chipboard flooring will be managed outside, to eliminate dust and debris inside the house. For added safety and cleanliness, we also use protective dustsheets inside the building and loft. We believe in value for money for our customers. That’s why, each square metre of our chipboard flooring can cost as little as £20! What our customers think about our flooring�? Find us for your loft flooring! If you’d like to speak to one of our friendly team members today about your loft flooring requirements, call us free on: 0800 169 6517, or tell us what you’re looking for by filling out our online enquiry form, here. Walton-on-Thames, Weybridge, Woking, Cobham, Esher, Oxshott, Kingston, Staines, Ashford, Sunbury, Hampton, Teddington, Surbiton, New Malden, Wimbledon, Worcester Park, Epsom, Ashtead, Leatherhead, Guildford, Feltham, Twickenham, Chiswick, Richmond, Sheen, Putney, Raynes Park, Surrey, Middlesex, London.